The Greenland Ice Sheet: How fast is it changing, and why? This was a project of the Glaciology and Climate Change research theme. The Greenland Ice Sheet (Fig. 1) covers 80% of the Greenland land surface area of 2.2 million km2. The volume of ice in the ice sheet is 2.9 million km3. The geographical position of the ice sheet ranges from 59° to 83° north and from 73° to 110° west. Each year, snow accumulation provides the equivalent of 680 cubic kilometers of ice and if the ice sheet was in a steady state it would lose the same amount by surface melting and iceberg discharge. The Greenland Ice Sheet is thought to have formed approximately 3 million years ago when glaciations in the northern hemisphere became extensive. The cause of Northern hemisphere glaciations is not fully established. It is possible that tectonic processes such as the uplift of Tibet and closure of the Panama Sea Way caused global cooling, but it has been suggested that a decline in atmospheric carbon dioxide could have triggered the most recent era of glaciation in Greenland. Figure 1. 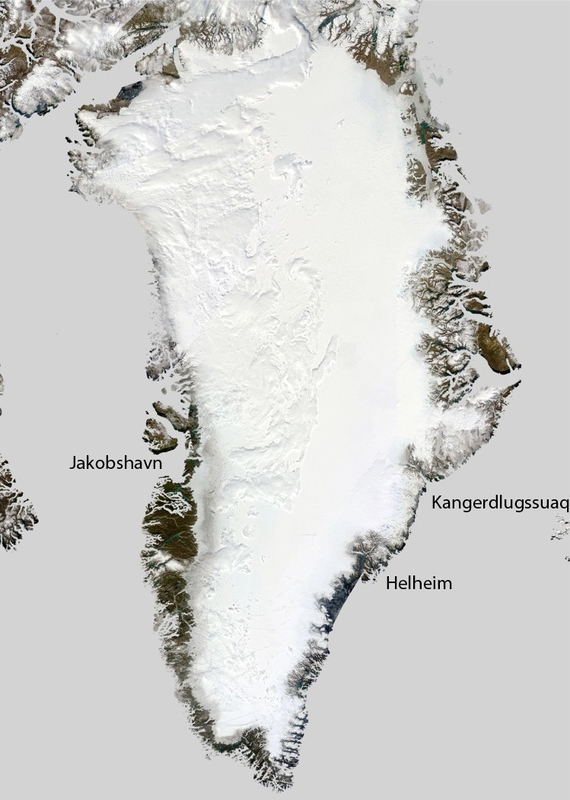 Image of the Greenland Ice Sheet from MODIS images acquired on the 14th and 15th August 2011. The mass balance of ice sheets is the difference between net accumulation of snow and the combined loss of snow and ice by melt processes and iceberg discharge. The mass balance of the Greenland Ice Sheet to have deteriorated from a steady state in the 1970s and 1980d to state by which the ice sheet is losing mass year after year. The various approaches used to measure ice sheet mass balance have different strengths and weaknesses and mass loss estimates are not always identical. The relatively short timescale of satellite observations makes it difficult to accurately determine the magnitude of decadal variability in snowfall, surface ablation and iceberg calving. This uncertainty is becoming less significant because mass-balance measurements are becoming longer and supported by new and complementary investigative techniques. Today, there is a consensus amongst scientists that the Greenland Ice Sheet is losing mass at a pace of around 200 gigaton of ice per year. One gigaton of ice is approximately the same as one cubic kilometer of ice. The rapid loss of ice from the Greenland Ice Sheet since the mid 1990s coincides with a period where atmospheric temperatures were high. The seasonal extent of surface meltwater, which has been monitored by satellites since 1979, shows a variable, but progressive increase. Meltwater runoff from the Greenland Ice Sheet was exceptionally high during the summers of 1995, 1998, 2003, 2006, 2007 and 2010. Accurate measurements of surface displacement with Global Positioning Systems have identified a relationship between changes in surface velocity and the timing and intensity of surface melting. 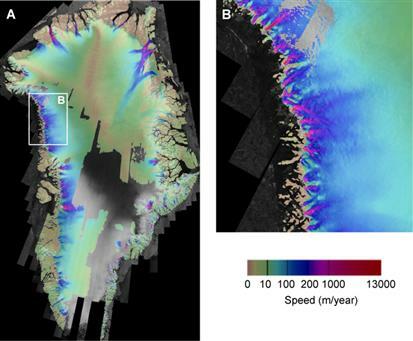 The link between ice flow and seasonal production of surface meltwater has been examined closely because satellite remote imagery show that glacial lakes on the surface of the Greenland Ice Sheet are numerous and widespread in the ablation zone (Fig. 3). Figure 3. Satellite imagery (MODIS) showing large and abundant supraglacial lakes along the western margin of the Greenland Ice Sheet. The lakes discharge into the ice sheet regularly, causing alteration of the flow speed. A direct response of the Greenland Ice Sheet to atmospheric forcing is of crucial significance because it may influence contemporary rates of sea-level change. If surface lowering occurs in response to surface melting and increased speed of flow, it could trigger a precarious positive feedback whereby an increase in surface meltwater production increases the surface melt extent, which lead to yet more surface meltwater and so forth. An effective hydrological connection between surface and bed may therefore accelerate the pace of ice moving from the interior towards lower and warmer elevations. This effect could potentially lead to a demise of the ice sheet over a time period shorter than current predictions suggest. Recent studies have confirmed the occurrence of short-term velocity fluctuations in response to penetration of surface meltwater to the bed of the Greenland Ice Sheet. However, the impact of the mechanism remains uncertain when it comes to fast-flowing outlet glaciers and its influence seems restricted to the relatively slow-moving, land-terminating part of the ice sheet. If so, its ‘good’ news. 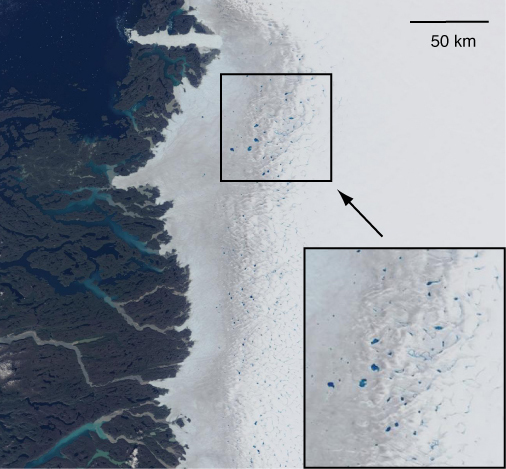 Land-terminating glaciers have not changed significantly in recent years, at least not compared to the widespread and synchronous retreat reported for outlet glaciers terminating in seawater. This suggests that the cause of recent rapid change is linked to the ocean. The exact nature of the oceanic forcing is not yet known, but recent studies have shown that warm waters originating from the subtropical Atlantic is entering Greenland fjords, causing rapid melting of submerged ice-fronts and thereby higher discharge of icebergs into the ocean. Outlet glaciers in Greenland are steep and fast and they contribute to sea-level rise in a significant way despite their modest widths of approximately 5-8 km or less. The fast flow of these glaciers is causing about half the current rate of ice mass losses. Approximately half the ice discharged from Greenland into its surrounding seas come from a dozen glaciers. Of their collective discharge, almost half comes from the largest three. These glaciers are Jakobshavn Isbræ on the west coast and Kangerdlugssuaq and Helheim Glaciers on the east coast (Fig. 1). Jakobshavn Isbræ was one of the first glaciers where major contemporary changes in flow dynamics were detected. The calving front of the glacier was in a relatively stable position from the 1950s to the 1990s. In 1998, the front retreated by 5 km and this caused flow speeds to increase from 5 km/year to 9 km/year. More dramatic changes followed between 2001 and 2003 as the majority of a floating ice tongue collapsed and caused the calving ice front to retreat several kilometers. This caused speeds to increase to 13 km/year. Very similar events occurred in Kangerdlugssuaq and Helheim Fjords on the eastern other side of the ice sheet. The front of Helheim Glacier retreated 6 km between 2001 and 2005. Subsequently, the speed of the glacier increased from 7 km/year to 11 km/year. 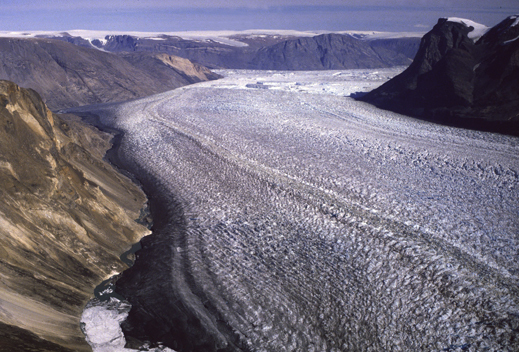 Kangerdlugssuaq Glacier experienced an abrupt retreat of 7 km between 2004 and 2005 and its flow speed almost doubled from 7 km/year to about 13 km/year. Whereas Jakobshavn Isbræ maintains its fast rate of flow, Kangerdlugssuaq and Helheim glaciers are now flowing at rates below the peak speeds reached in 2005. Figure 4. Photograph of the fast-flowing Daugaard-Jensen Glacier in East Greenland. The Greenland Ice Sheet was in the past perceived to be in a relatively stable position and its demise was thought to require thousands of years of melting under warm climatic conditions. This premise has been questioned in light of the recent change. Assessing the sensitivity and response of the Greenland Ice Sheet to the current warming of Earth’s ocean and atmosphere is today an issue of tremendous scientific, societal and political significance. The Greenland Ice Sheet contains enough ice to raise global sea levels by approximately 7 m. Assessment of climate change using an ice sheet model forced with outputs from a global climate model suggests that global warming of 3°C is a critical threshold that could lead to a complete demise of the ice sheet. This threshold will most likely be exceeded before 2100 unless emissions of carbon dioxide and other greenhouse gasses are stabilised and reduced to level of year 2000 before 2050. This level of greenhouse gas reduction will require an economic outlook consistent with greenhouse gas emissions scenario with a global emphasis on resource-efficient technologies and global solutions to economic, social and environmental sustainability. The alternative is less rapid economic development with emphasis on local solutions and environmental protection. So far, global economic growth remains fossil-fuel intensive and this economic outlook is not consistent with a sustainable long-term presence of an ice sheet in Greenland. The onset of a demise of the Greenland Ice Sheet may be tied to a predictable magnitude of global warming, but there is currently no consensus about the rate of demise. A demise of the ice sheet controlled by surface melting mainly could take several thousand years. This scenario is, however, unlikely on the basis of recent rapid change of the flow speed of marine-terminating outlet glaciers. The main reason for this crucial lack of information is associated with the representation of dynamical processes in ice sheet models. At the moment there is only a rudimentary representation of outlet glaciers in computer models of the Greenland Ice Sheet. The available computational power is limiting the size of grid cells to 5 km or more, whereas most glaciers have widths that are even smaller. Glaciologists are working hard to improve this. The Greenland Ice Sheet is not in balance, it is losing mass, and the net annual mass loss is typically around 200 gigaton. This rate of ice-mass loss is equivalent to global sea-level rise of 0.6 mm per year. Approximately half of this loss is caused by runoff from increased surface melt. The other half is attributed submarine melting of marine-terminating glaciers and their discharge of ice into the ocean. Whereas surface melting can be attributed atmospheric warming and global change, the acceleration of outlet glaciers is linked to warming of fjords and other coastal environments due to inflow of subtropical waters. Box, J. E., L. Yang, D. H. Bromwich, and L. S. Bai (2009), Greenland Ice Sheet Surface Air Temperature Variability: 1840-2007, J. Clim., 22, 4029-4049. Christoffersen, P., R. I. Mugford, K. J. Heywood, I. Joughin, J. A. Dowdeswell, J. P. M. Syvitski, A. Luckman, T. J. Benham, Warming of waters in an East Greenland fjord prior to glacier retreat: mechanisms and connection to large-scale atmospheric conditions, The Cryosphere, 5, 701–714, 2011. This paper is publicly available through open access: www.the-cryosphere.net/5/701/2011/). Christoffersen, P. and M.J. Hambrey, 2006, Is the Greenland Ice Sheet in a state of collapse?, Geology Today, 22, 99-104. Das, S.B., Joughin, I., Behn, M.D., Howat, I.M., King, M.A., Lizarralde, D., and Bhatia, M.P., 2008, Fracture propagation to the base of the Greenland Ice Sheet during supraglacial lake drainage: Science, v. 320, p. 778-781. Gregory, J.M., Huybrechts, P., and Raper, S.C.B., 2004, Climatology - Threatened loss of the Greenland ice-sheet: Nature, v. 428, p. 616-616. Holland, D.M., Thomas, R.H., De Young, B., Ribergaard, M.H., and Lyberth, B., 2008, Acceleration of Jakobshavn Isbrae triggered by warm subsurface ocean waters: Nature Geoscience, v. 1, p. 659-664. IPCC, 2007, Climate change 2007: The Physical Science Basis. Contributions of Working Group 1 to the Fourth Assessment Report of the Intergovernmental Panel on Climate Change: Cambridge, UK, and New York, USA, Cambridge University Press, 996 p.
Pfeffer, W.T., Harper, J.T., and O'Neel, S., 2008, Kinematic constraints on glacier contributions to 21st-century sea-level rise: Science, v. 321, p. 1340-1343. Rignot, E., Box, J.E., Burgess, E., and Hanna, E., 2008, Mass balance of the Greenland ice sheet from 1958 to 2007: Geophysical Research Letters, v. 35. Shepherd, A., and Wingham, D., 2007, Recent sea-level contributions of the Antarctic and Greenland ice sheets: Science, v. 315, p. 1529-1532. Straneo, F., G. S. Hamilton, D. A. Sutherland, L. A. Stearns, F. Davidson, M. O. Hammill, G. B. Stenson, and A. Rosing-Asvid (2010), Rapid circulation of warm subtropical waters in a major glacial fjord in East Greenland, Nat. Geosci., 3, 182-186. Zwally, H.J., Abdalati, W., Herring, T., Larson, K., Saba, J., and Steffen, K., 2002, Surface melt-induced acceleration of Greenland ice-sheet flow: Science, v. 297, p. 218-222.